House Public Information Services produces online content and print publications designed to make the legislative process understandable and accessible to the public. This resource is an introductory guide to the legislative process. It begins with a description of the state government structure and continues with a detailed explanation of the law-making process. Session Daily, an online news source, is updated daily during session with the day's House actions, and when news from the House warrants. An electronic notification list announces daily updates. Sign up now. The nine-part Minnesota State Government Series is an easy-to-understand series of publications about the state, its history, its symbols and its three branches of government. New Laws summarizes newly enacted laws, vetoed bills and certain proposals that did not pass into law during a given legislative session. Produced for the web after each session, it includes a search function that will help viewers easily locate a story. 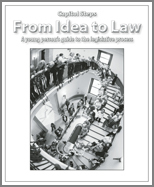 Capitol Steps: From Idea to Law (A young person's guide to the legislative process) - is a 16-page booklet explaining, in a simple, straightforward manner, how a bill moves from an idea to law. Capitol Steps is intended as a resource for junior high school students. For archives of the nonpartisan magazine, click here. Election Directory - Directories of the House members-elect from 2018 back to 2001. House member election statistics (2019-2020) - A listing of House members election statistics. House pronunciation guide (2019-20) - A pronunciation guide of House member names. Minnesota House and Senate members (2019-2020) - A roster of all House and Senate members, their office and phone numbers. House committee roster (2019-2020) - A listing of House committee membership, staff, meeting rooms and times. House committee schedule (2019-2020) - A grid of the House committee schedule and committee chairs. House Seating Chart (2019) - A diagram of where members sit in the House Chamber. Minnesota State Symbols Coloring Book - Designed for preschool and elementary-aged youth, this publication provides information about the state's 17 symbols. Minnesota House of Representatives Puzzle Book - Designed for youth ages 9-13, the Minnesota House of Representatives Puzzle Book makes learning facts about the legislative process challenging but fun. Committees-At the center of the legislative process - A tri-fold brochure describing a committee's role in the legislative process and how to testify at a committee. Tune into your Minnesota Legislature - Information about television and other video services provided by House Public Information Services. Minnesota state and federal offices (2019) - Contact information for Minnesota's eight members of the U.S. House of Representatives, its two U.S. senators, Minnesota's constitutional officers and other key contacts within state government and the Legislature. Press Releases from House Public Information Services - Press releases, including new laws that take effect in January, July and August. State fair poll results (2018) - Each year at the Minnesota State Fair, House Public Information Services conducts an informal, unscientific poll of fairgoers. These publications are posted as Portable Document Format (PDF) files. To view PDF files, you will need the free Adobe Acrobat Reader. Adobe also provides free accessibility tools for screen reader access.